Einhorn is Finkle! Finkle is Cundiff! An hour before the Ravens took on the Patriots I still didn’t know who I was rooting for. Ray Lewis fills me with hateful rage that makes me want to take a golf club to my TV if it means I never have to see him unhinge his jaw and scream his stupid pre-game scream again. But Tom Brady. Tom Brady. I want Tom Brady’s tears. I want to shower in them. Bathe in them. Splash around in them and jump in puddles of them like a child joyfully welcoming the spring rains. I want a monsoon of Tom Brady tears. I want a rogue wave of Tom Brady’s tears large enough to capsize Australia. So biblical hate versus biblical hate. Who should I root for? Then I asked myself this question: Who could you not bear to see in the Super Bowl? WHO ARE YOU?! WHO AM I?! If you’ve never seen Ace Ventura: Pet Detective, how do you sleep at night? Also, SPOILER ALERT. But now that Ray Lewis is dispatched and Tom Brady is in the Super Bowl against the Giants who destroyed him in it four years ago, I’m suddenly an Eli Manning fan praying for a tsunami of Tom Brady’s tears to wash Baltimore off the map. Football makes me violent like doom. Something tells me Brady’s a tucker like Einhorn. I had the same dilemma, but I decided Ray Lewis + Terrell Suggs were worse than one Tom Brady. But YES, it was weird to root for the Patriots, and I still feel dirty! That video makes me all warm and fuzzy on the inside. I too had trouble cheering for Brady even when I thought of how he could remove the evil of Lewis/Suggs from my vision and not allow them any hope of ever winning another Superbowl. My favorite part of the game was the slow motion replay of Suggs’ hopes and dreams being shattered before our very eyes when Cundiff missed. That meant I literally got to walk to work through a cloud of tears shed for those purple-clad miscreants. It was like dancing through a cloud of cotton candy. nobody should EVER cheer for anything named Manning. yuck. eww. Like the family at the end of the block that had all kinds of junkers parked all over thier lawn, and then would act like arrogant dorks if you ever looked at them. eww. on the other hand, nobody should EVER cheer for Tom Brady. yuck. eww. he even had a Justin Bieber haircut at some point, competing with Tebowel’s EllenDegeneres haircut. Ewww. Can the DVR just record the commercials and skip the game? 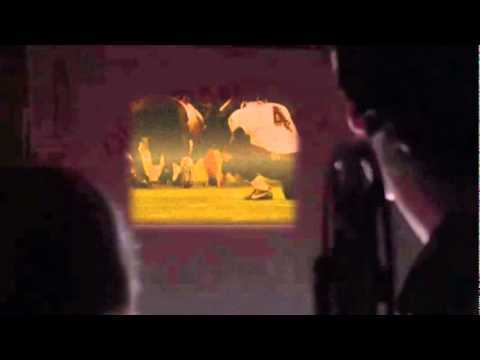 As soon as he missed the kick and they showed footage of them turning the laces out, I thought of Ace Ventura! I shouted out that it was just like Ace and no one else in the room got it! I’m glad you did! So do these feelings about Tom Brady make him Scott Tenorman and you Cartman? I’m beginning to think football fandom is a manifestation of some kind of mental illness that turns otherwise happy, cheerful, pleasant people into head-kicking Droogs. I mean, as a Pirates fan I have no love for the Brewers, but I don’t wish for their plane to go down in a flaming fireball of fiery deathness. Remind me never to turn my back on you. Droogs, bucdaddy!?!?!? Like, Alex and his Droogs from A Clockwork Orange?!?!?!?!? I think I’m going to want you to be the main speaker at my funeral! Not in any hurry to schedule, though. You loved Kojak and know Clockwork Orange. Awesome. Sorry budaddy…..as a Pirates fan I WANT the Brewers plane to go down in flames. Along with the Patriots, Ratbirds (tho I imagine they take a bus but that can crash as well), Bengals, Browns, Flyers, Islanders, Rangers, Devils, Red Wings, yep…anyone that dares beat my beloved Pittsburgh teams in a repeatable or big way. :) But I’m just violent like that. Spit, Choke & Puke on DVE yesterday morning: “To Steeler Nation, the only favorable outcome of a Baltimore/New England game would be Ray Lewis getting arrested for Tom Brady’s murder.” I laughed for a good ten minutes. I don’t want the Pats to win, obviously, but I can’t stand Eli Manning. Oh, well. At least he’s not Peyton. Go Giants!! I am sooooo glad Scott Paulsen is back!! LOL – that is perfect!! I never see a point to rooting for a team when I hate both, so I simply planned to bask in the schadenfreude of the team that lost. I didn’t watch the game, just flipped over a few times for updates – including just in time to witness the shanked kick, which made me laugh Nelson-style. But if they’d pulled out the win, I’d have simply focused on enjoying the Patriots’ loss (and would have rooted HARD for a Ravens SB loss in Indy, since these hypocrites down here still violently hate the Colts even though Baltimore is a worse offender in not only stealing Cleveland’s team when they know how that feels, but also in denying Cleveland what would have been their first/only Super Bowl win). As for the SB, it is really quite simple. 1. If the Patriots win, then the Belichick/Brady era team ties the Noll/Bradshaw Steelers dynasty with 4 SB wins together. 2. The Patriots are EVIL, while the Giants are merely annoying. 3. Some of the Maras are also Rooneys. GO GIANTS! New Pittsburgh Dad today is Dad asking his Ravens fan neighbor Tom how he is doing!! My world is sort of rocked to realize that I may have been in the minority cheering for the Ratbirds. Yes, it made me want to vomit, but I did it for the league, man. A cheer for the Ravens is a finger in the eye of the most precioussssssssss of the precious quarterbacks.